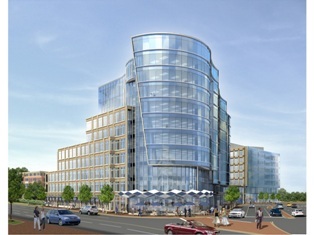 ARLINGTON, Va.– The Arlington County Board today approved a mixed-use project for the last unplanned redevelopment site in the Ballston Metro station area. The project will replace the former Bob Peck car dealership with office buildings, affordable apartments, townhouses and retail space. Located at Glebe Road and Wilson Boulevard, the project will include two office buildings, incorporating more than 400,000 square feet of office space and 36,000 square feet of retail space; 90 units of affordable housing, and 28 town homes. The two office buildings are proposed to achieve LEED (Leadership in Energy and Environmental Design) certification. The 10-story office building at the corner of Glebe Road and Wilson Boulevard (Office Building A) will include 282,989 square feet of office space and 26,292 square feet of ground floor retail space. It is proposed to achieve Gold LEED certification. The seven-story office building, mid-block along Glebe Road (Office Building B) will include 132,827 square feet of office space and 9,949 square feet of ground floor retail. It is proposed to achieve silver LEED certification. A 6,600 square foot public plaza will be built south of this building. The project includes 28 market-rate townhouses — 19 on the west block, between Wakefield and Woodrow Streets, and nine on the east side of Wakefield Street. They are proposed to achieve at least 175 points under the County’s Green Home Choice rating system for environmental sustainability. A four-story affordable apartment complex will replace the existing Jordan Manor’s 24 affordable rental units, and add 66 units, for a total of 90 affordable housing units. It is proposed to achieve at least 200 points for energy efficiency and other environmentally sustainable measures, through the EarthCraft rating system. The County secured a net increase of 66 affordable units in the Metro corridor and the developer’s agreement to secure LEED certification for the office buildings in exchange for a density bonus of more residential units and larger office buildings. AHC, Inc., a non-profit affordable housing developer, will own and operate the affordable apartment complex, and has agreed to keep the units affordable for a minimum of 30 years, and will work with the County to keep it affordable for 60 years. AHC owns and manages the existing 24-unit Jordan Manor apartment complex on the west block; that complex will be replaced, and an additional 66 units will be built, for a total of 90 affordable rental units. Projected rents range from $1,050 for a one-bedroom unit to just under $1,500 for a three-bedroom unit. Approximately seventy-five percent of the apartments will have two or three bedrooms. The new complex will feature a community room, a recreation/play area located in the interior plaza and underground parking. The 22 families who now live in Jordan Manor will receive a relocation package, and AHC staff will help them find replacement housing in the area. The families will have priority to return to the new complex. The four-story building received preliminary approval from the Board, and is expected to come back later in the year for consideration of its site plan. The project proposal includes several other major community benefits, including a contribution of $5.9 million toward affordable housing; utility under-grounding and full streetscape along all frontages of the site, which would substantially improve the pedestrian experience, particularly along Wilson Boulevard. The design includes substantial open space. Additional community benefits include new traffic signals and crossings, improvements to Wakefield Street, after-hours public parking in the office building garages, and a $75,000 contribution to the County for public art. The Site Plan Review Committee met seven times from January 2007 to January 2008 to study the land use history of the site, discuss and establish a development framework within which to review the site plan and review the proposed final site plan. The developer met numerous times with the Bluemont Civic Association. Together, the developer, the community and County staff worked to ensure that the buildings tapered from Glebe Road to the Bluemont neighborhood to the west and south and that the townhouses and apartment building provided a transition from the commercial buildings to the neighborhood. The site is 210,167 square feet (4.82 acres) in an “L” shape, comprising the roughly rectangular northwest corner of North Glebe Road and Wilson Boulevard and the southern portion of the block between North Wakefield and Woodrow Streets on the north side of Wilson Boulevard. It previously contained a mix of commercial and residential zoning: the former Bob Peck car dealership on the east block; a big box retail store (Staples) along Glebe Road, and two single family homes on the rear of the block along North Wakefield street. The original site plan proposal included only the east block and included two office buildings along Glebe Road and 28 townhouses fronting Wakefield Street. County staff identified an opportunity to achieve significant affordable housing with this site plan proposal, enabling AHC to build a new, larger apartment building on the southern end of Wakefield Street. Project Name: 800/900 N. Glebe Rd. 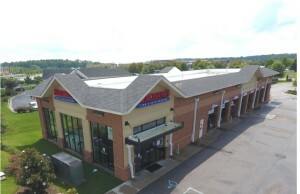 Location: 800/900 N. Glebe Road, site of the former Bob Peck Dealership and Showroom, existing Staples and Jordan Manor sites. Arlington, Va., is a world-class urban community that was originally part of the “10-mile square” parcel of land surveyed in 1791 to be the Nation’s Capital. It is the geographically smallest self-governing county in the United States, occupying slightly less than 26 square miles. Known for its urban villages and transit-oriented development, Arlington maintains a rich variety of stable neighborhoods, quality schools and enlightened land use. In 2002, the county was the first recipient of the Environmental Protection Agency’s highest award for “Smart Growth.” Home to some of the most influential organizations in the world – including the Pentagon – Arlington stands out as one of America’s preeminent places to live, visit and do business.